This page is hosted by JewishGen, Inc. The shtetl synagogue served many needs. It was frequently the site of the study hall or beit midrash, the cheder. and in smaller towns (Snitkov?) would also have provided the equivalent of today's community meeting space, even for non-religious issues affecting the whole population, such as civil legal problems, politics, the Haskalah-Chasiddism disputes. Holidays within the synagogue might have included both celebration and feasting. (JAFI). Sketch Copyright Michelle Frager 2004. The photo on which the sketch is based can be seen in Wooden Synagogues (WS, image 245). The authors describe the Snitkowo synagogue as likely from the 18th Century, with twin windows, a western vestibule, probably two women’s sections (south and north), and the main hall having lower structures along two sides. Construction was of wooden beams and horizontal boards, but of horizontal timbers in a south annex; annex roofs are noticeably contoured. In the left wall of the second story, you can just see one of the large main windows, and also masonry work at the ground level corner. The building appears to be set in a surround of earth and scrub grasses. = The Holocaust Memorial Center in Farmington Hills, MI, e-mail: info@holocaustcenter.org. 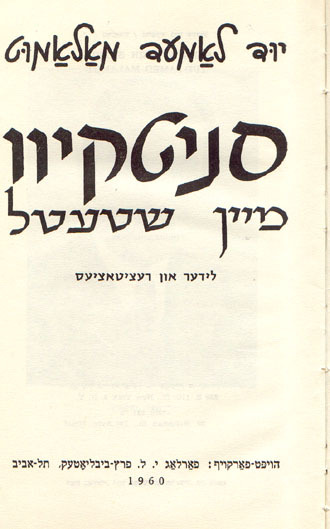 = Yeshiva University Libraries YULIS in New York City. Copyright Michelle Frager July 2004.